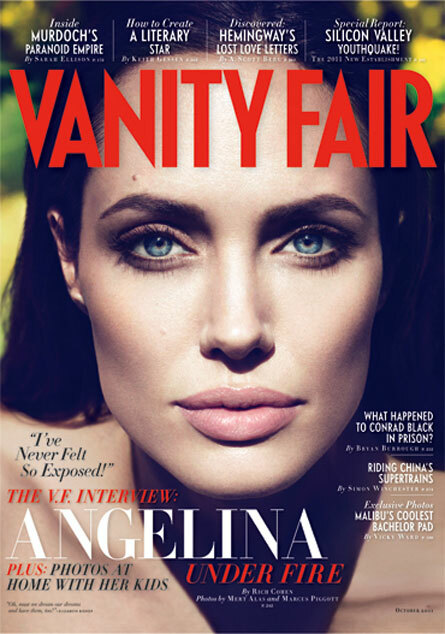 Angelina Jolie is on the cover of Vanity Fair October 2011 Issue! Check out Angelina Jolie on the cover of Vanity Fair Magazine’s October 2011 issue! In the article she promotes her new passion project, “In the Land of Blood and Honey” which is a movie about a couple in love during the Bosnian war. She talks about how her partner, Brad Pitt, supported her throughout filming, and answers yet again whether or not she’ll get pregnant or adopt any more children. “Brad thinks I’m going to be a nightmare. I had such a good experience he thinks I’m going to be impatient with directors, which I already am. I get impatient with people working on a film that have their head in their hands like it’s the most complicated thing in the world.